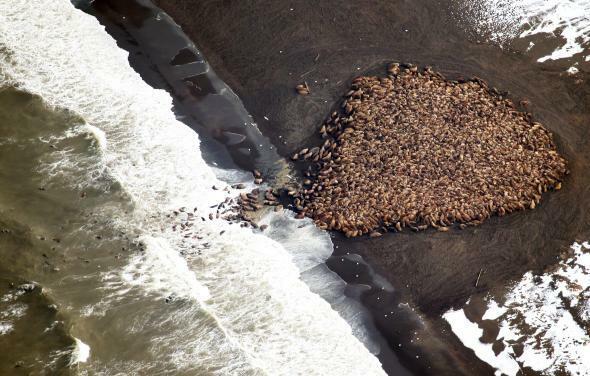 Alaska walrus "haul-out": Sea ice melts, animals collect on beach in possible global-warming consequence. This photo of an estimated 35,000 walruses near the village of Point Lay, Alaska is from September 2014, but the same phenomenon has already begun occurring this year. For decades, more and more ice has been melting nearly every summer in the Arctic. This is a problem for walruses that “haul out” onto the ice to “rest between foraging bouts to the seafloor” (as one does). In all but two years since 2007, the U.S. Geological Survey has noticed masses of walruses hauling out onto Alaskan beaches rather than ice because much of the ice no longer exists. And as Mashable reports, a photographer named Gary Braasche has documented an especially early mass haul-out this year in a series of striking photographs which you can see on the World View of Global Warming website. 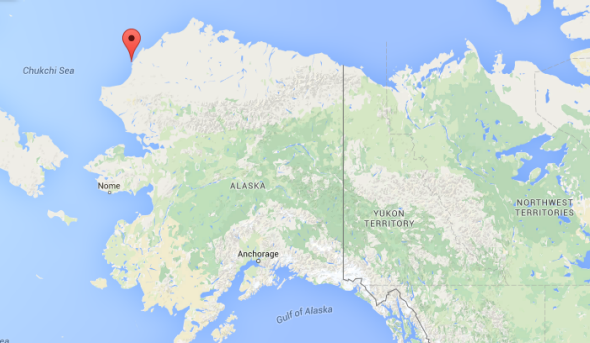 President Obama is visiting Alaska next week for the explicit purpose of highlighting climate change problems and is expected to travel to the village of Kotzebue, which is 200 miles south of the area where the animals are beached.